Its now more than 2 months, that we(me and my colleagues aka Flipperz) attended the class. More precisely, we last attended regular classes on 14th of August. On 15th evening, we left for our 5 day tour and when we were back, it was time for study leave. Theory exams were like a marathon, which took more than a month to finish, even though there were 6 subjects. After that came the DSA Lab practicals. Mine was over on 14th this month, but exams continues till 21st as we have two batches in CSE. So, as a result, almost 2 and a half months without classes, which is one of the largest gap, in my entire school/college days. Still, one more practical is left and there are chances for it to be being scheduled by the end of this month. So, the gap will increase again. When there are regular classes, we all will be looking for ways to get a leave. Now, as far as I know, all are hoping for the classes to start soon; not because of the thrive to study, but it feels being irritated staying home, without the company of friends and the jokes and other stuffs that happens daily @ college. For me, I spent most of the time at Fastech Systems, doing this and that, playing network games, browsing net and so on. There were rumors that the class will be suspended by noon. After the 2nd period, few seniors came with the notice and all was happy. I have nothing to do at home, so, I stayed at college and with the permission of HOD, continued with the Debian installation in the Internet and Multimedia lab of CSE department. Though Mahesh was present, he was busy with some other works. My classmate Mansoor KPA also helped me in the installations. 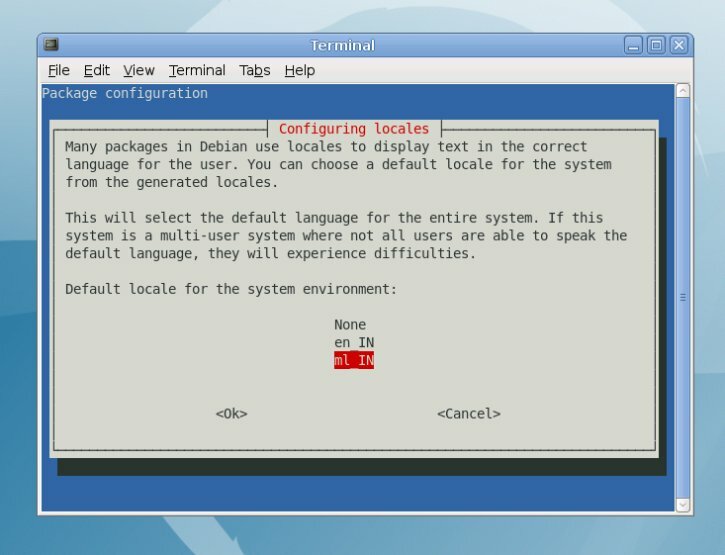 By 4.30PM, we installed 15 systems with Debian and the one alloted for GNULab with gNewSense. My views on todays workshop @ MESCE on "Introduction to GNU"
During the starting, there were a few problems with registration of students from ECE, EEE and AEI, as the HOD’s allowed a maximum of 5 per class to participate, but there were more than 15 from some classes willing to participate. And because of that, the participation was more than what we hoped and we had to go in search for more chairs. Writing down the registration details was another problem. Writing down the name and roll number is not at all convenient(Its from my experience), especially after the students enter the auditorium. So, for next time, its better to find an alternative way for recording attendance, may be it could be computerized(hmm…. Another topic for time pass programming). Anyway, a few of us including me, lost the first two sessions due to the rush and confusion. So, no comments about the first two sessions. In the introduction, the only thing I heard was “GNU is not UNIX”, not once, but more than thrice. Can someone tell me what was going on there? The unconference session was also interesting by the participation of students, even though the number reduced to 1/4th of those present during the starting. Everyone really enjoyed the videos shown, especially the animation movie made with blender. Among the distros for sale, Debain Lenny recorded the most sale and there was hardly a CD of it left after the workshop. The cost was RS 20 per CD and RS 40 per DVD. I wonder why students brought it for that price; even though its available in the digital library. A few students asked me how to change the interface to Malayalam. I think it was not explained during the workshop. 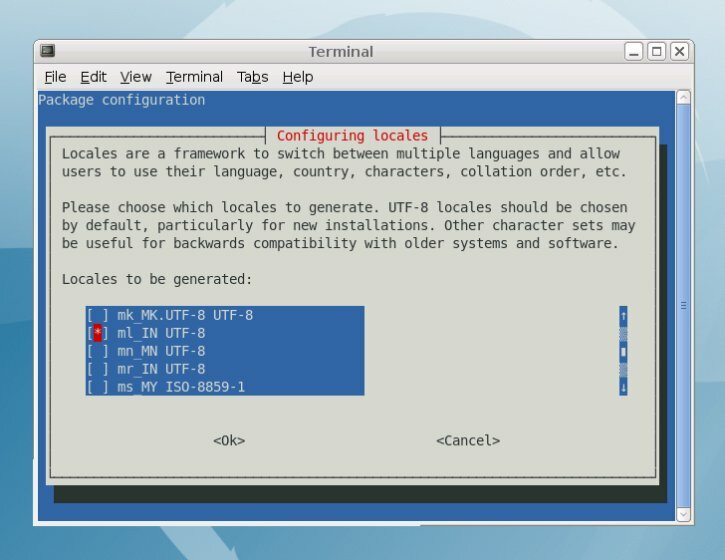 So, here is how to do it in Debian. 1) Downloaad a Malayalam Unicode font. Its available in the SMC wiki. 6) Select “ml_IN” and press OK. The locales will be generated. 7) Now restart your system. All the menu’s will be in Malayalam after restart. It can be changed back to English by selecting the Language option in the Login Screen. Today, I also got a few new distros including Fedora. Tomorrow, there is a full day workshop on “Introduction on GNU”. The IT department has been suspended. Though we tried, CSE department was not suspended, but allowed duty leave for all who wished to participate. The program is conducted by IT department along with MES-FSF chapter. Here is the final draft for the workshop.